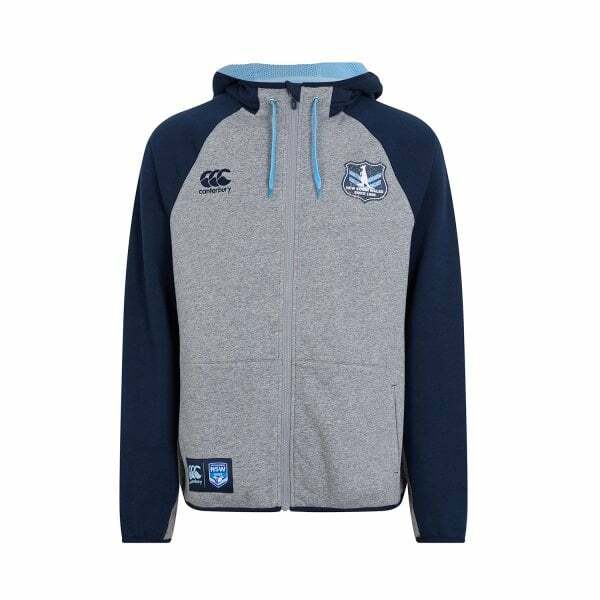 Made from 300gsm Cotton and Polyester brushed back fleece, our Vintage Zip Thru Hoody is the perfect way to stay warm while supporting the Blues this Origin season. Canterbury’s Vintage Zip Thru Hoody is the ideal way to keep warm outdoors this State of Origin season. Built with 55% Cotton and 45% Polyester brushed back fleece 300gsm, this quality hoody is designed to provide you with maximum warmth while you cheer on your team. The vintage style badge detail at the chest makes it quite clear which team that is, with the kangaroo and NSW Centenary Shield displayed proudly for all to see. A versatile hoody that’s stylish enough to wear anywhere the weather turns cold, get yours now from the 2019 NSW Supporters collection at Canterbury.